Name of the Village Shanghar is by virtue of The Lord Shangchul. The story behind this is that Lord Shangchul had come from the Sangla Village of Kinnaur Valley to overcome the terror of devil souls and for the welfare of villagers of Shanghar. In actual, the Lord Shangchul is a snake who take place on the right hand of Lord Shiva and who carries toxic flies in his mouth instead of snake venom. These flies in local language called ‘Raiis’ hence called ‘Raiinaag’ also. 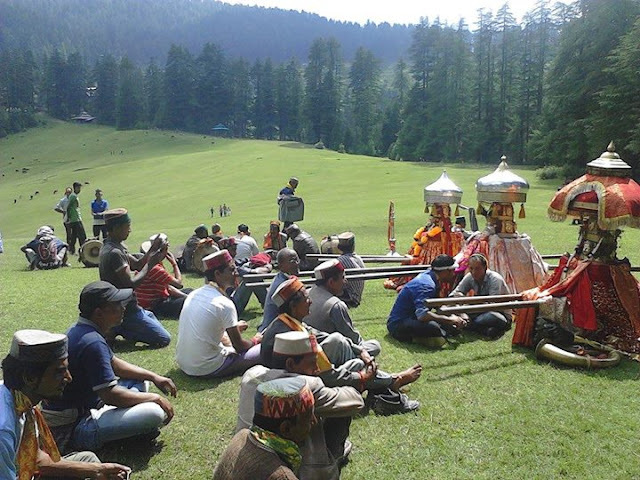 When Lord came from Sangla, the king of Kinnaour Valley also used to come with Lord in order to see off Lord at Shanghar. The first place in that huge ground of village Shanghar where the King of Kinnaur used to sit first and after that this place is dedicated forever for the King and even for the single soul of the Kinnaur Valley. And it is also often said that this huge ground of 250 bhighas was made and crafted by Pandavas during their exile period (Agayat vas) and hence there is not even a single stone in this ground. When Lord Shangchul arrived at this ground, on arrival he announced that this ground is for cattle’s and ‘Bharmins’ of Shanghar Village and even making of noise, using abusing words and entrance of Police is strictly prohibited. In the next half of the story, there is a history that the lovers feel themselves protected in this village with the blessing of Lord Shangchul and all villagers in respect to Lord , provide everything of the use like shelter, food, cloth etc. to lovers or we can say the place is beyond any law. Every year in the month of February and June villagers celebrate Village fair which are dedicated to Lord Shangchul and which attracts people and tourists from all over the world.